Mary and Scott are prepping the interior and exterior of their Victorian house in the 5100 block of 42nd Avenue in Hyattsville’s National Historic District for next spring’s tour of homes organized by the Hyattsville Preservation Association. It’s referred to as the Shepherd-Sibley House. Mary and Scott Sibley didn’t expect that building a rear addition onto their Victorian era home in the Hyattsville National Historic District would be a simple undertaking. But by hunkering down with architect Mike Arnold, they received the appropriate and far-from-routine blessings from the Prince George’s County Historic Commission and the Maryland-National Capital Parks and Planning Commission. Construction on the family room they have been craving began just this week. In the meantime, the Sibleys are brainstorming about how to properly decorate the 18-feet by 20-feet extension so it flows with the interior of the rest of their three-story, 1906 home. Hardwood floors are a no-brainer. Eight double-hung, single-pane windows framed with bulls-eye molding will extend almost the entire nine feet from floor to ceiling. The centerpiece of the addition will be a fireplace. 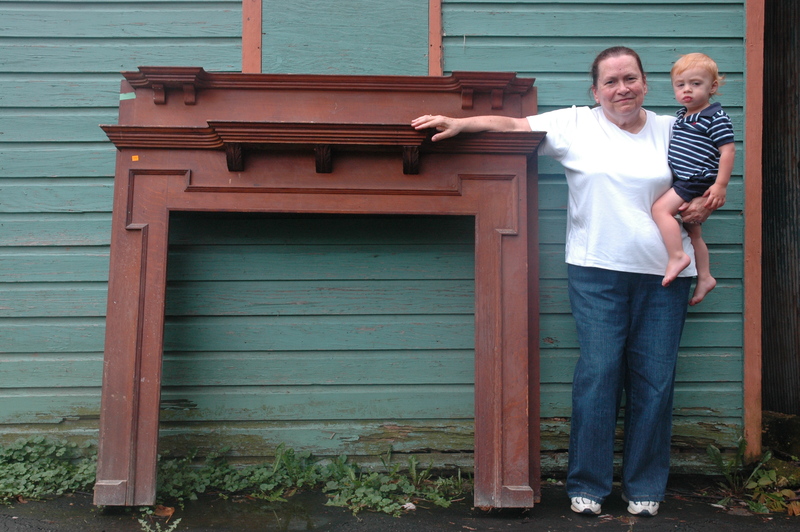 With Arnold’s help, the Sibleys found a reproduction of a 19th century cast iron insert. However, they had a devil of a time hunting down a proper mantelpiece. That is, until they literally went around the corner to the Community Forklift’s 34,000-square foot warehouse a few months ago. Bingo. They scouted out an authentic fit. A yellowing paper tag attached to the back of the double-shelved, oak antique they selected spells out that the Dame Mantel Co. in Harriman, Tenn., delivered the finished product to Washington, D.C., in 1910. And the Forklift price was right: $225. The Hyattsville couple had expected to shell out $1,500 to $2,000 for a reproduction. Appropriately, preservation architect Mike Arnold set up his office in a 1924 building at 6220 Rhode Island Ave. that served as Riverdale Park’s first post office. 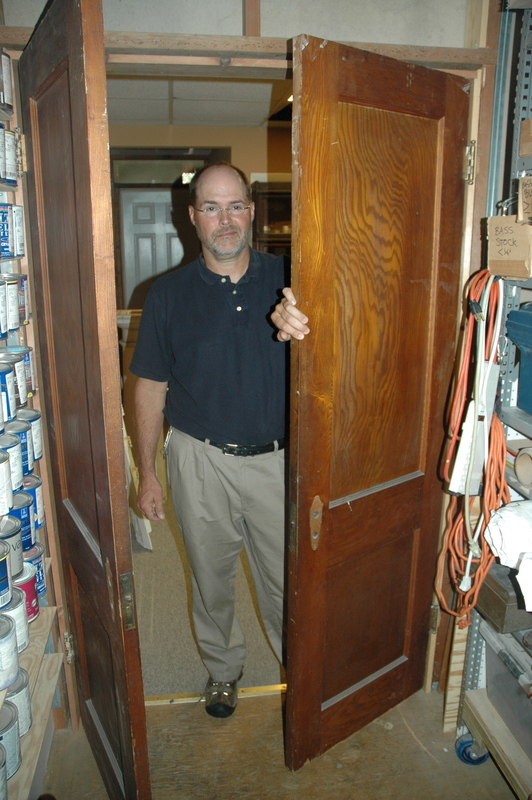 He installed a pair of chestnut doors he bought at Community Forklift as part of an effort to restore the building’s tasteful touches. Arnold, their Riverdale Park architect who specializes in historic preservation, casts the Sibleys and others like them who make regular forays to the Forklift into a category he labels “defective consumer.” He credits one of his graduate school professors with coining that distinctive phraseology. While such offbeat language might sound like a pejorative to the uninitiated, Arnold actually dishes the two-word term as the ultimate accolade. What Arnold means is that homeowners such as the Sibleys should be celebrated because they refuse to be brainwashed by the messages that bombard them daily in a throwaway culture that pooh-poohs what appears to be passé. Instead, they reject the consensus that an item must be brand new and out of the box to have any value. Arnold’s initiation into architecture and preservation began more than three decades ago when he enrolled at the University of Maryland. Later on, he taught Maryland students the hands-on ABCs of restoration. When he eventually opened his own architecture business, he opted to focus on preservation, with a focus on pre-World War II homes. He estimates that somewhere around 25 percent of his clients are comfortable with the concept of reuse, so they already know the value of the Forklift and other similar treasure troves. Others, he said, have to be nudged in that direction so they can understand that there is “gold in them thar hills at the Forklift.” Sometimes, the challenge can be finding enough reclaimed materials to complete a substantial addition. 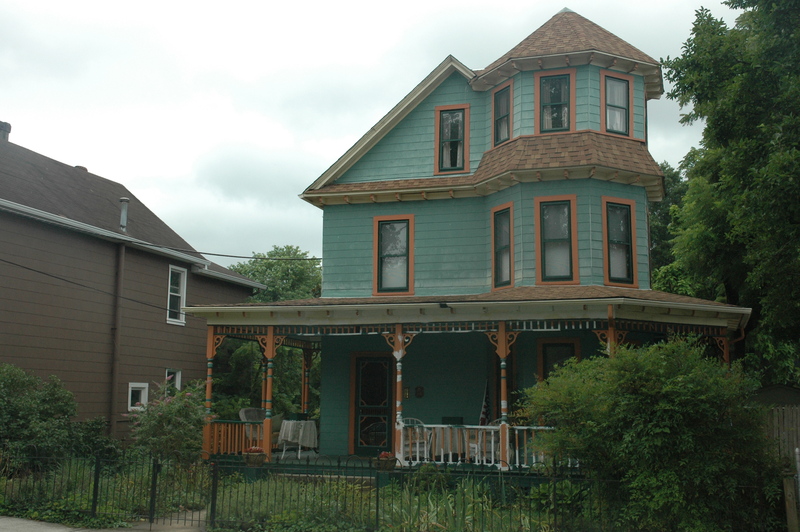 It pains him physically and emotionally to watch older homes in nearby neighborhoods be stripped of riches such as irreplaceable pre-1940s, double-hung wood windows because their owners have fallen for the myth of vinyl. Usually, he said, the original windows are trashed before anybody can retrieve them. Window sashes from the 1920s and 1930s are a premium product because they were machine manufactured from old-growth wood, he noted, adding that covering them with top-notch triple-track storm windows provides the ultimate in energy efficiency and insulation. Arnold’s dedication to the preservation cause is echoed by Alfonso Narvaez, chairman of Prince George’s County Historical and Cultural Trust. He saluted the Forklift for providing two crucial services. One, it’s a repository for materials such as sinks, bathtubs and mantels with defining features of this particular region of Maryland. And two, Narvaez said, the Forklift allows homeowners to see a complete house disassembled so they understand how it can be put back together with the appropriate pieces. Narvaez knows of what he speaks. Professionally, he operates Aeon Preservation Services, a Bladensburg-based business that has tended to such iconic landmarks as the U.S. Capitol dome, the White House grounds, the Jefferson Memorial and the Lincoln Memorial. In that capacity, his company once collected a smorgasbord of brick, marble, granite and terra cotta to teach professional conservators gathered at Arlington National Cemetery how to restore these building materials. Unique places such as Community Forklift, Arnold and Narvaez agree, become more and more vital as the lumberyards, hardware stores and custom millwork shops of yesteryear disappear. Mary Sibley and her 17-month-old grandson, Jake, with the 1910 oak mantel from Community Forklift that will be a highlight in the family room the Sibleys are adding to their historic home in Hyattsville. The Sibleys, who moved to the Washington, D.C., region in the mid-1970s, purchased their current Victorian home in 1989 when their two sons were in elementary school because they “wanted an old house.” The couple is still plugging away on their pet project almost a quarter-century later. Some enterprises during those 24 intervening years are new, such as refinishing banisters and balusters, while others are repeats, such as repainting the entire house and porch with a distinctive green complemented by trim that is dark green, orange and cream. Scott, a retired federal geologist, and Mary, who built a career in day care and as a special education teacher, are hoping their home is in tip-top shape for the spring 2014 house tour being organized by the Hyattsville Preservation Association. The addition of family room became a necessity with the birth of Jake, their first grandchild, 17 months ago. They expect he won’t be the last arrival. 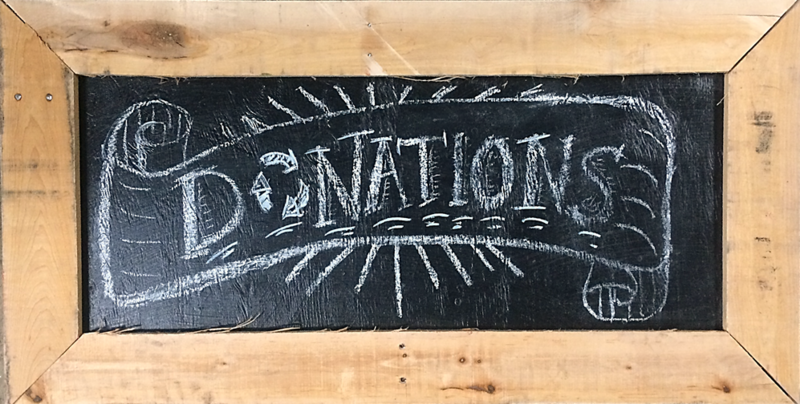 Both Sibleys will continue to haunt the aisles of the Forklift and other local businesses to track down house necessities they can reuse.